The Bank of Montreal (BMO) kicked off its 200th anniversary year by revealing a unique fountain with a digital twist at the location of its first-ever branch, in Toronto on Tuesday. Like many fountains located in mall pavilions and central courts, the new feature at First Canadian Place will invite people to make wishes. But instead of tossing a coin into flowing water, wish makers will cast their desires online via a new mobile-friendly website at BMO200.com. When they do, the digital fountain reacts by changing its patterns via 50,000 electromagnetic flip-dot tiles – the same technology commonly used at early train stations for destination boards. Here’s a better look. The #BMO200 digital fountain. You can make a wish for it online. The fountain, standing at 17-feet tall will be at First Canadian Place until early March. First Canadian Place has been the headquarters of BMO since 1977, but the bank first set up shop in Toronto in 1842. From Toronto, it will travel to Chicago for the spring and then to Montreal for the summer, before returning to Toronto for BMO’s bi-centennial on Nov. 3. It’s no accident that the fountain combines older, tactile technology with more modern digital technology, says Connie Stefankiewicz, CMO at BMO. It’s a symbol of the transformation the bank is undergoing. 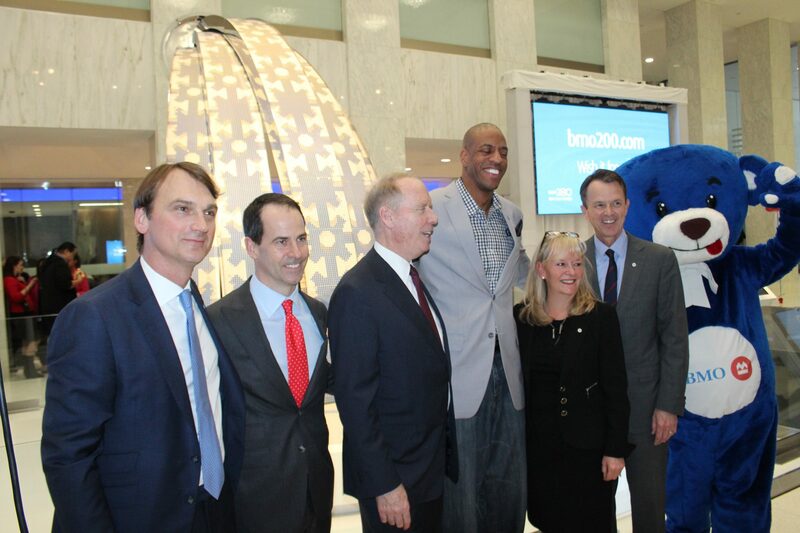 BMO executives, including CMO Connie Stefankiewicz (third from left) pose in front of a new digital fountain feature at First Canadian Place, along with former Toronto Raptor Jerome ‘Junkyard Dog’ Williams. Stefankiewicz points to a couple of digital firsts that BMO launched over the past years as examples of its innovation. It introduced SmartFolio, a digital wealth management service, and the capability to open a bank account from a mobile device. Until last year, Canadians had to physically sign a document at a bank to open up a chequing account, but regulation changes opened up digital channels and BMO was the first to offer a mobile-first approach to opening a bank account. “We’re in the midst of a digital transformation as an organization, it’s a journey that we’ve been on for a number of years and one we’re going to escalate,” she says. While digital has become an increasingly used channel by BMO customers, the CMO says that the branch is still an important way to communicate with customers. Opening a chequing account is one thing, but when people are making more complex banking decisions, they often want to sit down face-to-face and talk to someone. The physical fountain and its connected digital assets was a collaboration between Globacore Interactive Technologies and Secret Location, says Ben Unsworth, president and co-founder of Globacore. Globacore created the fountains and Secret Location created the web front-end. On hand to unveil the fountain was Brad Duguid, the Minister of Economic Development and Growth for Ontario. Also taking part in the ceremony were the Toronto Raptors mascot and former fan favourite Jerome ‘Junkyard Dog’ Williams. BMO is a sponsor of the Raptors. There are also five other smaller, more mobile fountains of the same design that will be traveling around various locations. The smaller fountains are 12 feet tall by six feet wide at the base. The first appearance of the mini-fountain will also involve basketball, as it will be at the BMO Bradley Centre during a Milwaukee Bucks game. “The idea is to get it out there where people are so they can make their wishes and experience it,” Stefankiewicz says. The wishes made aren’t just for fun. BMO says that it plans to grant wishes that it is collecting to the different categories available, including: Green, Togetherness, Legacy, and Community.